When I said I'd write a post about red paint, I meant it. Anyway, I needed a new flesh tone so I decided now was a good time to buy more paint. Since my Mechrite Red is running pretty low, I figured I'd need to find some sort of new red. So, I now have a pot of GW Mephiston Red. For a shade comparison, see below. 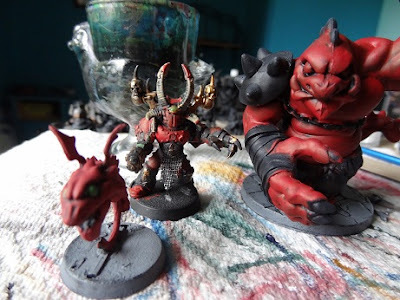 The Wyrmling on the left is Mechrite Red, the CSM in the middle is Blood Red and the Kobold Ogre on the right is Mephiston Red. My opinion is that it's a bit darker than Blood Red but not as pinkish as Mechrite Red. 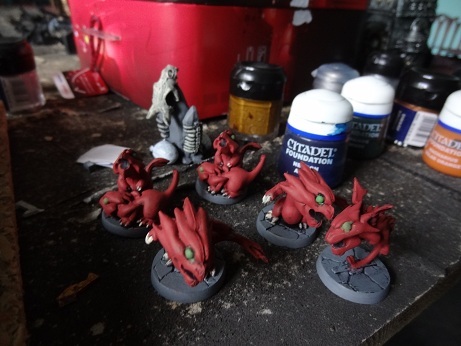 Coverage is pretty good, so I think I'll roll it out for the rest of my Kobolds. More painted stuff after the jump. 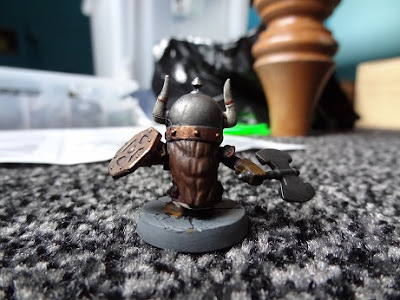 Following the advice of this FTW post, and to prevent hobby fatigue, most of the stuff I've painted in the last month or so has been Super Dungeon Explore stuff. I painted the Whelps, Hatchlings and Wyrmlings first as they're pretty simple to do and, along with their Egg Clutch spawn point, they form a nice little group. 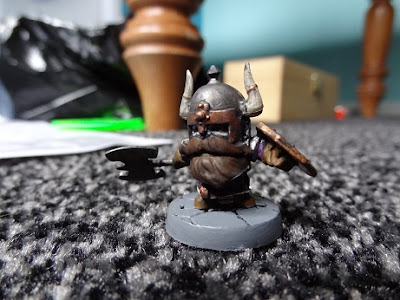 I painted one Hero too, the Dwarf Hearthsworn Fighter. The base is entirely Codex Grey, to put it back to vaguely the same colour it is out the box. As he's a dwarf, I've gone for the cliched earthy colour range, with ink to darken him, with the exception of his jerkin(? ), which is purple. Anyway, he is a dwarf and he's digging a hole. Diggy diggy hole, he's digging a hole. I'll probably spend some more time on the Kobold Ogre next. In the meantime, go visit Bryss & 'Scape Inc., the spin-off LP blog of this blog. It severely needs the love. A new Viet Crystal part has been released, so the blog should be covering that about now.